Renewing their commitment to offering a holistic wellness experience in 2019, intimate Bintan estate, The Sanchaya, is boosting its health and fitness offerings, with a spa renovation and the announcement of visiting experts throughout the year. The tranquil property is ideally positioned to soothe and rejuvenate the mind, body and soul, and compliments its stunning design and location with a range of gurus, who are onsite both permanently and temporarily to boost the overall guest experience. From Monday 7th January – Monday 14th January, The Sanchaya will welcome renowned Pilates Specialist and Personal Trainer, Rosie Gregory, to complete a residency at the estate. Having worked with leading studios across Australia, London and Asia, Singapore-based Rosie specialises in sculpting, soulful and sweaty workouts that empower and uplift mind, body and spirit. During her time at The Sanchaya, Rosie will focus on a mixture of Pilates, Sculpt Method, full body sessions and stretching classes, with morning sessions focusing on HIIT and full body workouts and afternoons dedicated to stretching and breathing. All classes will be complimentary for in-house residents. To complement Rosie’s classes, The Sanchaya will be offering an enhanced wellness menu throughout her residency, with highlights including Magic Matcha Tonic. A favourite of Rosie’s, Matcha Tonic is known to boost health and wellbeing and has incredible effects on the mind and body, with benefits including boosted metabolism, regulated blood sugar levels, reduced stress and blood pressure, improved memory and learning. Set to open just ahead of the New Year, The Sanchaya’s newly renovated spa will see the addition of two new treatment rooms. The first will be a Beauty Room; boasting two state of the art mani/pedi stations, the Beauty Room will see the addition of natural manicure and pedicure treatments and CND shellac paint options. The second new room will be used as a Relaxation Room, and will be kitted out with comfortable seating and lounging areas where guests will be able to relax before and after their treatments with a detoxifying tea or rejuvenating fresh juice. Spa Manager, Ria Cantle, will be adding Aroma Hot Coconut Hair and Scalp Treatments to the menu; this relaxing head, scalp and shoulder massage uses organic Indonesian coconut oil with added infused essential oils of May Chang, Cedar Wood and lavender, which are all known for their therapeutic healing properties. Whilst the Coconut Oil will improve the overall condition of the hair, adding shine and softness, the massage will target pressure points and use different strokes to help relieve stress and deliver a feeling of calmness. As part of the spa’s rejuvenation, Ria will also introduce Sodashi products; Sanskrit for wholeness, purity and radiance, Sodashi uses the purest natural ingredients, taking a holistic approach to beauty that transcends skincare to nurture the mind, body, spirit, and emotions. The new treatments will complement the existing fresh menu of organic scrubs, incorporating products unique to the Indonesian archipelago, which were introduced by Ria earlier this year. Having started her career as an Auxiliary Nurse in the UK, Ria followed her true passion for wellness to Northern India, where she refined her practice alongside industry experts at Ananda in the Himalayas. Since then, Ria has gained international experience in some of the world’s leading hotels, specialising in Deep Tissue Massage, Reiki Healing and Crystal Healing. Located less than an hour away from Singapore, The Sanchaya is a boutique beachfront estate nestled amidst luscious tropical gardens and the sparkling Indian Ocean. 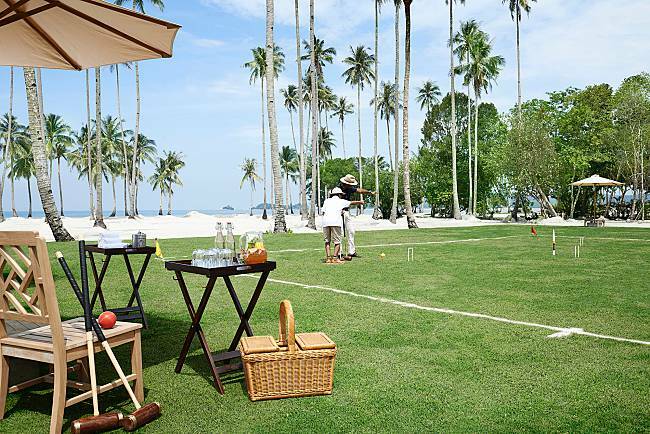 With an Indonesian-inspired spa, private croquet lawn, endless white beach, and several world-class dining options, The Sanchaya is one of the most convenient, yet inspiring, weekend escapes from the city. The Sanchaya’s next health and wellness residency is set for March 2019, when celebrity trainer, Artur Zolkiewicz, will return to the estate. For further information about The Sanchaya, visit www.thesanchaya.com.